40 år har gått sedan Led Zeppelin släppte albumet Physical Graffiti – ett av tidernas mest hyllade dubbelalbum. 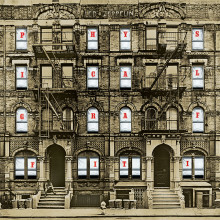 På 40-års jubileumet släpper de nu Physical Graffiti Deluxe Edition – en nyutgåva med tidigare osläppt material. Led Zeppelin and Spotify today announced that the band’s legendary Swan Song/Atlantic catalog is now available for streaming on Spotify. Nearly 45 years after the band’s groundbreaking debut album catapulted them to rock superstardom, Led Zeppelin’s full album catalog is now available to stream on-demand for the first time, exclusively on Spotify.